This is a sharp, full tang, "Battle Ready" sword. A new take on katana bamboo artwork, this model features a tall bamboo stalk on the hardwood saya (scabbard). The bamboo tree is hand carved and features branches and leaves which wrap around the saya. The carving is finished with green paint and located beneath the saya's high gloss lacquer coating. The matching tsuba (guard) has raised bamboo artwork. Other features include a sharpened 1045 high carbon steel blade with blood groove, all metal tsuba and fittings, black nylon handle wrapping and full tang construction. The blade's tang is secured using dual bamboo pegs. A black cotton sword bag is included for carry and storage. Cotton cord wrapped hardwood handle. High carbon steel blade w/ hand honed edge. Blade Length: 28 1/4 in. After reading the reviews I took a chance on this sword for $29.00. I'm very impressed with the feel, weight, and overall details of the sword. I have tried the blade on a few things and it's done fine. I bought this sword as a BOGO, and i love both of them. Very sharp, both in appearance and blade. Great sword for the price. Once again, TS got it to me very fast. No complaints. Highly recommend. 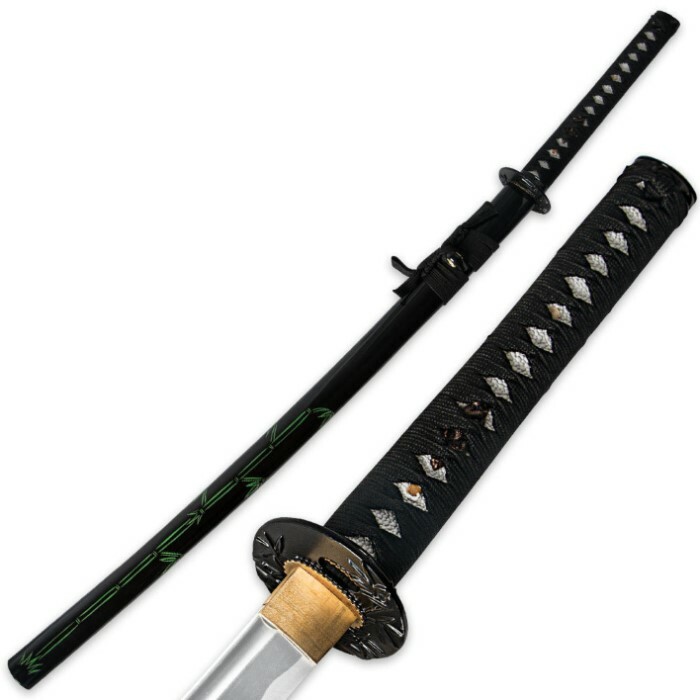 I had a friend who's dad purchased a $7000 dollar katana and I told him when I got mine we could see who's was better this sword was sharper better balanced and lighter than his cut way better and was actually better looking I applaud your sword very very impressive. Blade is VERY well made, scabbard had green etched in bamboo pictures on it that give it a nice touch. I am very happy with this purchase, extremely well balanced, solid construction, obviously made with some love. Get this now. 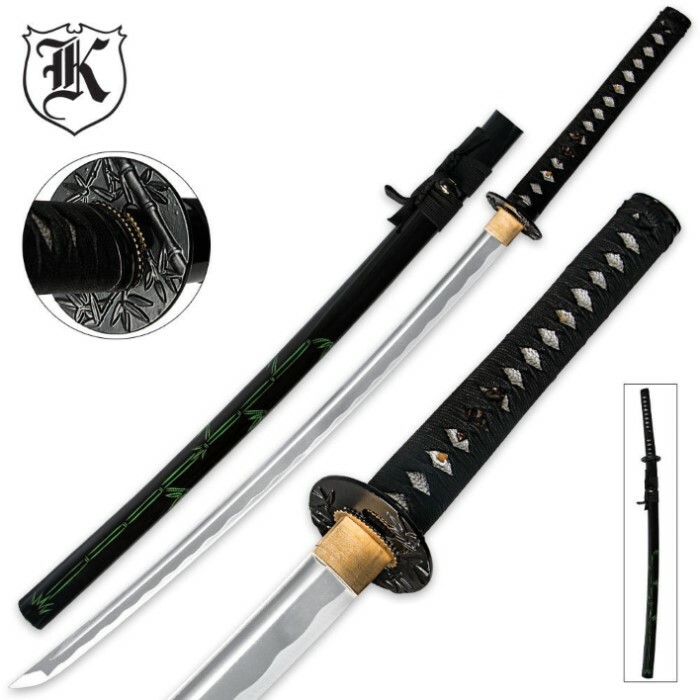 Great sword first buy from here not the last every thing was good nothing wrong with the saya nothing was loose it was sharp but not razor sharp the detail was very good all in all great buy. Absolutely beautiful. Could'nt stop counting the hours till the sword arrived. When I finally got it, my body tingled with excitement of simply holding it and gazing at it's beauty. The sword is sturdy and firm, also within its saya. Love the saya and first thing to catch my eye , simply gives the sword a touch of serenity and I'm glad to have add this to my collection of traditional Japanese items and culture. A spectacular deal, but my blade has a minor knick 10 and 1/4 inches down from the point, which is very annoying to look at. I'm dissatisfied with the minor flaw in the blade, but as for the decorative saya, I am extremely enamored with it's beauty. If you like collecting unique swords, knives, or weapons, I suggest buying this blade from trueswords. Anyways, yeah, nice, sturdy, strong. Overall good sword, slightly heavier than expected, but not too heavy. I asked my father to get me this for my early birthday gift and he trusts me with it. The delivery was on time and it is amazing. It amazed my dad as well. The design is elegant and fits well. The katana feels loose in the saya but it's just a peeve. Overall, this katana is a fine addition to my life.